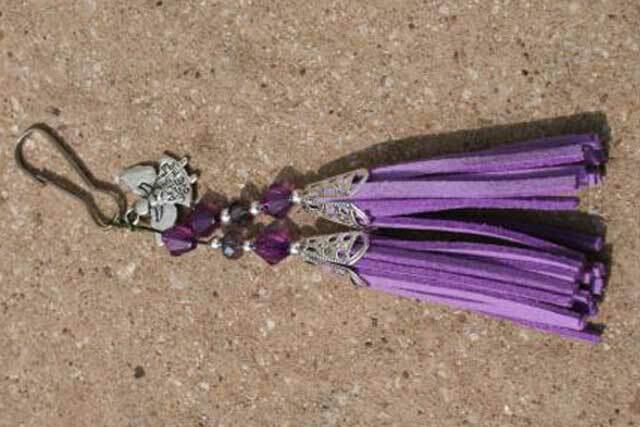 Lilac tassel with "Angels watching over me" charm and varied pretty beads. Our tassels are all handmade to order. They are approx. 5 1/2 inches (14cm) long including the clip. The tassels are made from faux suede, with various beads and a charm threaded onto strong fishing braid. It's worth noting that these are fancy tassels and as such please do not expect them to last forever if they are subject to off lead running through bushes, swimming, wet weather walks, rough play or chewing etc! Please note that the beads may vary from those shown in the picture.